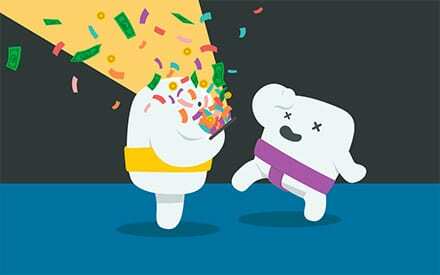 Mobile games: Over 100 real money mobile games including slots, table games, progressives, and video poker titles. 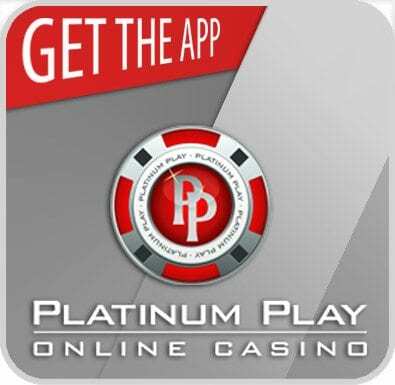 Platinum Play have always aimed to offer a luxurious experience when it comes to online gaming, and they haven’t failed to bring this edge to the mobile application. 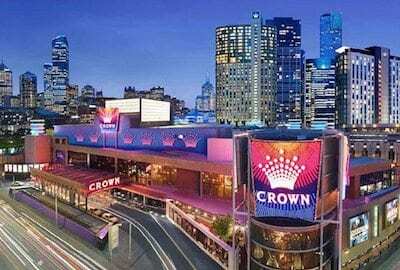 The operators established their premier gaming site in 2004 and have since earned their rightful place as a member of the prestigious Fortune Lounge Group of Casinos. The app, optimised for smartphones and tablets, was developed almost 10 years later allowing their players to game on the go. Platinum Play also has a mobile website but the purpose of this article is to review the app, which is available for both iOS and Android users. With a slick design and easy to navigate games lobby, the Microgaming-only catalogue offers a wide range of slots, table games, progressives and video poker titles. Regardless, the app still offers its own Platinum Play flair and looks quite fancy on your home screen – the icon features their suave red, black, and grey logo. Every time you open the app up, a soundtrack will commence which has a very luxurious feel to it. You can only turn this off by putting your device on silent, however. Once you do open it up, you will notice the easy to navigate interface, eligible to be viewed in landscape or portrait mode with the menu bars repositioning appropriately. The layout features a menu panel of subcategories you can tap on including ‘Games’, ‘Banking’, ‘Promotions’, ‘Help’, and ‘My Account’. 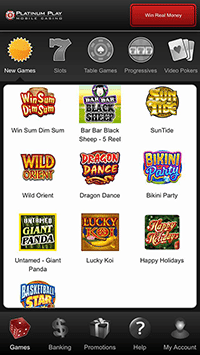 Tap to view, with the Games category offering the full suite of Microgaming mobile casino games, while the Banking category will allow you to make a deposit or top up – you can even make withdrawals on your mobile device. You can sign up on the app if you are a new player too, simply tap in your details and you will be sent a confirmation email. You may find it easier to sign up on your desktop device and log in with these details on the app however. There’s an array of promotions on offer too which you can opt in on your Samsung, Apple, Windows, or other portable device. These include the welcome bonus of $1000 in matched deposits and 50 free spins and the loyalty program on offer where you can climb up the tiers to earn big rewards. Drawbacks to the app include the loading times when first opening the app and accessing each category, as well as the fact there’s less games than the desktop version – but this is a given to all mobile versions of online casinos. There’s over 100 mobile casino games optimised for mobile devices, each eligible to play in real money mode – you can try the games out in practice play on the app too. The lobby is easy to navigate with the games categorised clearly – simply tap on the game type to view the list of available titles. Games include a wide range of slots, including the popular Thunderstruck, Avalon, Game of Thrones, and Loaded titles; a range of blackjack and roulette games including the Gold series of each category; progressives, including the popular Mega Moolah; and video poker games, such as Jacks or Better and Bonus Deuces Wild. Tap on the game you wish to play – all require landscape mode on your device to be enabled – and when you want exit swipe left and tap the ‘return to lobby’ button. To get playing with real money tap on the ‘Banking’ category and you can choose from a wide range of real money payment methods. These options are the same on the app as they are on desktop, including Visa, MasterCard, Neteller, Skrill, Paysafecard, and bank transfer, and the payment methods available to you will depend on the country you’re playing from. Once you have made a deposit your funds will appear in your account – to withdraw tap the Banking icon and follow the prompts. While Royal Vegas Casino and Casino-Mate do offer a similar app with the same games, if you are a fan of the polished look Platinum Play brings to the table and the welcome bonus of $1000 free bonus cash and 50 free spins, we recommend installing this application.